I have three beautiful children. As a parent, my style could be summed up in what is often referred to as Attachment Parenting. I have practiced extended breastfeeding, co-sleeping and babywearing with all three of my children. I’ve also been armed. These practices have made for a rewarding, close and loving environment for my kids but there are some fall backs when it comes to defensive tactics. The social and developmental benefits of babywearing are often debated among mommy groups all over the place, neither of which I will discuss here here. If you babywear you know the benefits of it for your family. 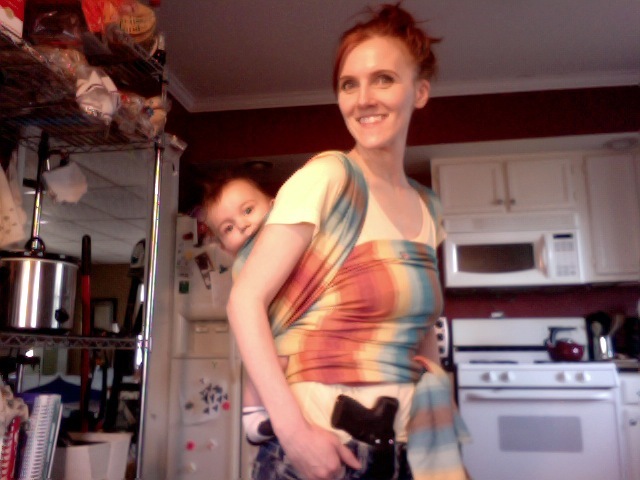 If you are interested in some basic babywearing and gun-carrying tips, please read Carrying A Gun And A Baby. What we are going to discuss here is the narrow scope of the pros and cons of babywearing from a purely self-defense standpoint. One of the best aspects of babywearing is that it allows for hands-free activity. Fighting, drawing a weapon, controlling an attacker long enough to gain access to a weapons, etc., are all easier with two free hands. Front-carried baby can inhibit a front-carried defensive system. Whether the baby is front or back carried will also have an effect on how easy it is to work in a particular space or allow access to tools. Babies too young to sit up on their own are primarily carried in front carriers and wraps. However, this position limits your range of motion slightly with a child on your chest and if you carry a defensive tool on the front of your body they can hinder access to said tool, depending on how high you carry and the size of your child. It will also completely impede your access to something like a flashbang holster. Front carrying a baby with a front carry defensive (handgun, knife etc.) system also hinders your ability to look and reholster your tools. It’s not a huge issue if it’s a fight for your life, but it’s something to consider. This is both a pro and a con (as we will discuss later) but a baby that is physically strapped to your body obviously cannot be easily left behind. One would think this would never be a concern but it is something that has happened on several occasions when it comes to violent crime or other emergency situations. This has a lot to do with the freeze, fight or flight response. These responses are designed for your personal self-protection and do not concern themselves with the defense of others. It is possible to leave your child behind in a flight response, but obviously not if that child is strapped to your body. Baby back carried makes defensive tools carried front-body more accessible and vic versa. Child snatching is a huge concern for many parents, despite the fact that it is statistically unlikely to ever occur–especially via a stranger. That does not mean it cannot and has not happened, however. A baby attached to your body cannot be snatched either as a means of kidnapping or to be used as a tool of compliance. There is also no chance that your child will be accidentally dropped in panic. To a degree, movement is easier when you are carrying a baby on your body. Yes, having an 8-20 lbs. child strapped to your body does degrade your movement to some point, but it’s a lot easier to move around with your child strapped to your body than with a baby in a stroller. If trying to escape a burning building I’d absolutely prefer to have my child strapped to me than in a stroller or in my arms. I would be less likely to drop my child, get caught up fumbling with my baby and a door, or have him knocked from my arms by other panicked patrons. This is the single most common issue I see with babywearing and carrying. Because of the nature of baby carriers that attach around the waist, over the chest, and across the back, some of the most common carry locations for firearms are compromised or hindered due to the carrier or baby interfering with the holster or draw. Sometimes it’s a simpler solution like changing the babywearing method or going to a different holster. Sometimes it means coming up with an entirely different defensive carry system depending on the method of carrying the child. What I have seen in practice is parents compromising access and putting their guns and holsters in places that are impractical and potentially dangerous for a self-defense situation. But that will be a blog for another day. Herein lies the single most terrifying part of wearing a baby from a defensive standpoint: If you take damage, it’s highly likely your baby will as well. In other words, babywearing is like pregnancy. While pregnant and under attack there is nothing you can reasonably be expected to do to protect your child. The same goes for babywearing. Because you can’t put your baby down or distance yourself and because your baby is so exposed if you are taking fire, it’s highly likely your baby is going to be shot. If you are under a knife attack, it’s likely your baby is going to be cut. If you are being kicked or hit or punched, it is likely your baby is going to be on the receiving end of those blows as well. You could certainly try to shield your baby from harm by turning him or her away and placing your own body between yourself and the attacker, but even that is no guarantee your child will not come to harm. As terrifying as that is to consider, it is something that must be addressed. If all of your preventive measures are overlooked and someone chooses to visit violence on you while babywearing you must be aware and prepared for the fact that it will likely mean harm to your child. As promised, I told you this was both a pro and a con. The con side of this particular coin is that you cannot leave your child behind to draw fire or violence away from them. If you are the target and not your child and the violence is centered on you, there is no quick, easy way to separate yourself from your child or give your child to someone who can take him or her out of harm’s way. If the fight is on it’s going to require fighting around the child. Hand-to-hand fighting is hard enough. Doing it with a 10-20 lbs. weight strapped to your back or front will make it harder. Your center of gravity is off. Your range of motion is restricted. Your ability to clench up or ground fight is almost gone. Roundhouse kicks? Front snap kicks? Vicious knees? All harder with a child strapped to your body. Not to mention the elevated degree of violence you may need may mean harm to your child. Let me rephrase: Running is always an option. It’s not always a good option, but it is an option. Remember that women often cannot run as fast as men. If you are a man, 20 lbs. of strapped baby will probably hinder you as well. If you have an opportunity to escape to safety you absolutely should take it! However, you have to reasonably understand what your capacity for escape is when you are carrying a child. Even if you are a runner, your ability to sprint with a child will be hampered. Try it sometime. Thankfully, crime against parents while they carry their babies is still quite low. While it does happen, it’s not so common as to be expected. That being said, it’s still a possibility. When the pros and cons are weighed exclusively from a defensive standpoint, babywearing is a terrible defensive tactic and has no real advantage and lots of disadvantages that can be devastating for both the parent and baby. That being said, babywearing does have great developmental, bonding and even health benefits for the parent and baby. Whether or not one decides to continue to babywear should be based on all of those factors as well as risk factors for actual violence. There are those who may decide that babywearing increases the difficulty in defending themselves too much and decide to no longer babywear. If that’s the case, that’s fine. While I have continued to babywear, I have amended my practices to make the outcome better for the both of us. –Be smart about when and where you wear your baby. This should go without saying, but it stands to reason that making smart decisions about where, when and who you are with when you babywear is going to help with your defensive options. Do you and your husband and your kids all have to go to the grocery store? Can you or your husband stay home snuggling the baby while the other goes to the store by him or herself for some alone time and therefore not have to worry about defensive situations with a child in tow? If required to go some place with a higher rate of violent crime, might it be better to place your child in a stroller vs babywear? It may seem counter-intuitive, as parents like to collect their children to their persons when they feel threatened, but from a purely defensive perspective it may not be the best tactic. –Have a means to get your baby off of you as quickly as possible. Safety cutter on the Benchmade Triage. This will have a lot to do with your type of chosen baby carrier. Buckle carriers are quicker to get in and out of than wraps, so given the choice between the two you might want to choose the one that is easier to get out of. Make no mistake about it, in an immediate, violent attack on your life you are not going to have time to remove your baby from your person. However, immediately after or if in a lull or in other emergency situations, you might need to get your baby off you and quickly. Carrying items like safety cutters or seatbelt cutters for straps or wraps may be an advisable option. Be sure to carry them in a location they can be quickly accessed. –Decrease the clutter you carry. If you babywear, it’s imperative that all other loads be kept to a minimum. Any additional bag will be that much more of a hindrance. Keep your on-body carry to your baby, pepper spray, your gun, your safety cutter and/or knife, money, identification and carry permit (if required), and phone. Avoid putting your gun in any off-body carry system, and if you must have another bag for diapers and baby gear keep that gear to a minimum and be ready to ditch the bag. It’s not easy to keep people away from you. We live in a world where people will encroach upon your personal space and it’s unrealistic to think you will be able to keep a ten foot radius of empty space around you at all times. That being the case, it’s still important to be aware of who gets within your space and control it as best you are able. This is not a suggestion as much as a command. Go! Do! Get pepper spray and carry it! Period. Not everyone who is a threatening presence deserves to be, or can legally be, shot. But they might deserve a good dose of pepper spray. As an individual who should now be able to articulate the reasons why you cannot fight or escape with a baby strapped to your body, you may be able to explain why you preempted by pepper spraying someone who was escalating and making you feel threatened. This absolutely does not mean that you get to go around pepper spraying people who make you feel uncomfortable. It is, however, an advisable alternative to going hands-on or escalating immediately to lethal force. -Practice your defensive options with your chosen babywearing options. 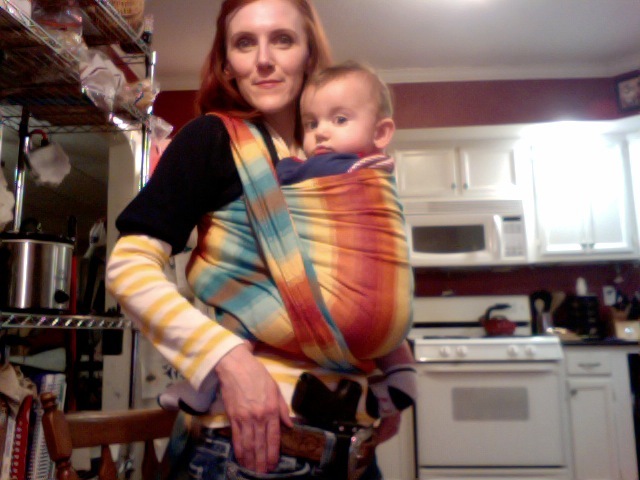 Go to the range with your wrap or baby carrier and a weighted baby-doll or bag of kitty litter. Practice drawing and shooting, moving, magazine changes, and single-handed shooting. If you find errors in your carry system work them out now. Babywearing and carrying a gun may not be the best tactical practice but that doesn’t mean it can’t or shouldn’t be done. If you choose to do it, make sure you do it as wisely as possible. Take some practical steps to ensure both you and your baby are as safe and secure as possible. Posted in babywearing, defense, parenting and tagged babywearing, carrying, parenthood. Bookmark the permalink. What wrap did you use in these pictures? I used a mobi-style when my daughter was smaller, but I would like something I can use to carry a larger child (she is now 16 months). I enjoyed the wrap much more than traditional carriers I used with my oldest. This is a tekhni. I have two firespiral wraps I use most often. Another Tekhni fan! I stumbled upon your blog trying to figure out what the heck I’m going to do these next few months as I grow, and came across this post 🙂 I recognized Arche immediately! I JUST learned about this class you did. I truly hope you host another! I will definitely attend and invite all my fellow bw mommas! Well, we have the parent conference coming up!